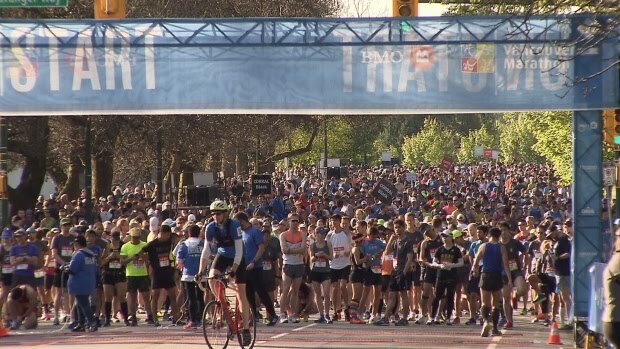 This morning was my first time running 8K in the BMO Vancouver Marathon. It was the perfect day for it, though by the time we started running at 9.30am it was already quite warm. 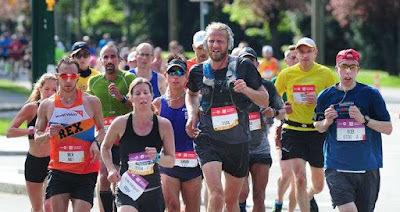 Before my trip to Vancouver, I saw on social media an ad for the marathon and thought it would be fun to take part and roped my friend into joining me. 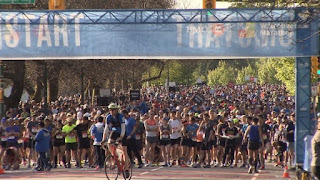 Turns out it was a good plan, and over 17,000 other runners took part in the 8K, half and full marathons. My friend and I met up at Oakridge station to take the Canada Line downtown to Waterfront Station where we got dropped off her bag for check-in near the finish at West Pender and Bute, and then we boarded a school bus to get dropped off near the start in Stanley Park. The shuttle service ended at 8.30am which meant we had an hour to kill before the race started. 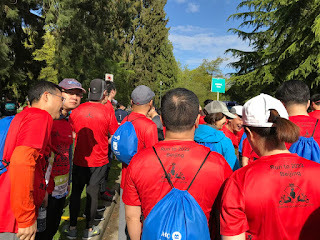 Near the starting line was a group of Chinese people, both Mandarin and Cantonese speaking who were part of a "Run to Beijing 2022" event on the grass. 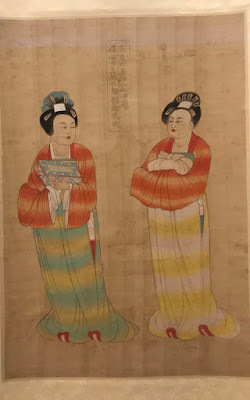 They all wore red T-shirts and there were some people who wore light blue sashes across one shoulder that read Xiamen Airlines Company. Some of them actually ran the race. These people took pictures of not only themselves, but also the half marathoners who were running past. Why were they doing that? It wouldn't surprise me if they made the half marathoners look like they were supporting Beijing's preparations for the Winter Olympics, and the red shirts were all paid for by the Chinese government. In any event we were reassured the Vancouver Marathon was definitely a Canadian one when all the runners assembled were asked to sing the national anthem. A few minutes later we were off! It was so nice to run through Stanley Park, luckily there was quite a lot of shade from the trees and it also helped having small bands playing loud music to keep us going. The first kilometre didn't seem to come fast enough, but the subsequent kilometres were actually relatively fast. There were several water stations and we took advantage of them as it was getting warm. As we ran we saw the gorgeous scenery along the Seawall, there was nothing but blue skies above us and the mountains to our left with just a bit of snow left over. It couldn't get more beautiful than that. The last kilometre was pretty much all uphill and I wasn't mentally prepared for it! After a short break we powered up and finally finished -- receiving a medal in the process! Unlike Hong Kong's marathon, there was no traffic jam at the finish line and we were able to take pictures near there. We also got loaded up on food -- we were given bags of chips, a banana, a choice of either vegetarian or turkey sandwich, bottle of water and energy bars. There was also a McCafe truck giving out free "specialty coffee" so we each got a cup of steaming hot brew. Everyone seemed in good spirits and wherever we went people congratulated us on our run. Congrats on your accomplishment! Did running with a friend make the going easier as well as more fun? Definitely! And she kept psychologically pushing me along!